Obesity has reached epidemic proportions in the USA and is considered a leading cause of heart disease. We are not talking about people that are a little over weight. This is an internal issue of body fat versus muscle. Someone can weigh a little heavier but have a lower body fat percentage. The flip side is that some people can weigh less but have a higher body fat percentage. Most of America’s problem is that their body fat percentage is too high. Clinical obesity is defined as above 25% body fat for males and above 30% for females. Obesity is associated with numerous medical problems. The excess fat places additional demands on the heart and lungs. People who are obese have increased incidence of hypertension (high blood pressure) and diabetes, high levels of cholesterol, and poor ratios between high-density and low-density lipoproteins. Another side effect of obesity is the stress it places on weight-bearing joints of the body. If an obese person could lose weight, there would be less stress on the lower back, hips, knees, and ankles. However, if it hurts to exercise then the person won’t exercise; thus they get pulled into a vicious cycle of inactivity and further weight gain. Fear of hurting one’s knee, back, shoulder, etc can grip one’s mind when they feel a twinge. The bottom line is that exercise is hard and it’s usually harder for people who suffer repercussions of obesity. How do we break this cycle? Part of living a healthy lifestyle is taking small steps. Dieting is taking all those steps at once. It’s only focusing on the weight number you want to be, cutting everything unhealthy out of your diet at once, and expecting time to exercise an hour a day 6 days a week. Try something new instead. By cutting back on only 50 calories a day and increasing your activity level, a person would lose at least a pound a month. “Well,” one might say, “but I’ve got 30 pounds to lose.” However, if all one does is what is stated above, in a year they will have lost at least 12 pounds. That sounds better than staying the same weight or gaining another 5 pounds in a year, yes? Most people who lose a lot of weight in a short period of time gain it back, but if you lose 1 to 2 pounds per month there is a good chance it will be gone forever! Successful weight loss programs require lifestyle changes of eating less/better quality food and moving more. Remember that excess fat is just unused energy. Start using that energy in the following recommendations. -Start out by doing something active several times a day, 5 minutes each time. Include but don’t limit yourself to push-ups, fast walking/jogging, squats, lunges, etc. Burning an extra 30 calories 3 times a day adds up to 90. Cut back a little on your food and you may save yourself over a couple hundred calories each day. WOW! -Focus on fruits and vegetables. If you make it your goal to start off eating 2 fruits and 2 servings of vegetables a day then you are bound to feel better and eat less “bad” food. This will help with calorie control. 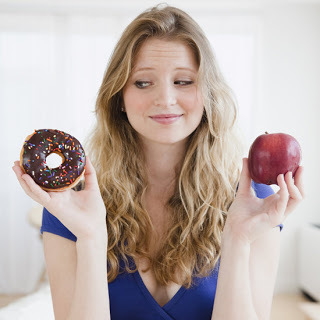 -Start removing little things from your diet that you won’t miss. Like snacking on those m&m’s at work when you go past the front desk. Or not ordering soda at a restaurant. At the end of the day or your meal will you really sit there and regret drinking water instead? I don’t think so! These are just a few tips. With New Year’s resolutions coming, remember to keep your head level and start making healthy choices now. Don’t binge now and plan to diet after Christmas and New Year’s. It will only make the cycle worse. Live in the present. Don’t regret your past choices and say “next month I will change.” Start making the right choices NOW.